I’m debating between Douglas Fir and African Mah. Preference and why? 1. Right now the door skin is plywood and it’s delaminating. She wants to find out what it would cost to modify the door and cut in a half circle top glass or full circle. 2. I do not have a CNC, so I’d have to do it the old fashioned way with a router. 2a. Since udding a router may be my only way of making the arched top, my thought is to glue a few boards together and route the arched top out of that and join the segments together via biscuits, dominos, spline or mortise and tenon. 3. Where could i ger weather stripping that will press into a groove. I will stake out the negative opinion and state my personal advice is to sub this out to a person that knows all about building doors. Everything comes together in a main entry door: Security, appearance, function, hardware, finish, durability, timing, and more. It is basic to have a working knowledge of finishes, hardware, weatherstrip, IGU, muntins and their joinery, sealants, glues, exterior jambs, sills or thresholds, wood species and door construction details and methods. You seem to have given the geometry some good thought, but that is the least of your worries. Where is your previous experience and at what level? Just because someone asks you does not mean you have to do it. I’m looking for advice from those such as yourself, to help “guide” me through the best practices on making these types of doors....not sub it out. We all didn’t become good at what we do over night, nor by not asking questions.....hence the reason i’m asking for guidance. If this came to me, I would encourage a completley new door and frame. Re-use the hinges, latch, and interior trim if possible. Patching onto an existing door means that if something pops 3' from your new work, you get the call, and you get to explain why it is going to cost more money - and time. There is not a clean way to join stile butts together if it is rail and stile (or frame and panel) or flush (as it sounds like). That, and the cost will be about the same for the repair over new. I can spend days and days piddling around on historic doors, whereas a new unit gets run thru the shop on its normal pace. Now curved muntins - that will be chapters 146 thru 182 in my How To Build A Door Book. It would take a half day of explaining with you in the shop, and it is distinctly tooling driven. More than a few router bits. That and every shop doing it is doing it differently. CNC is not required, by the way. We also only do divided light glass, and never tacky tacky muntins. A shaper is fundamental to door making, even if it is the upper half only. And a curve head door, frame and perhaps trim? Start shopping. We have two shapers for a two man shop, and over $16K in tooling. Some people get offended when others that think complex knowledge can be handed over in a few minutes of typing. I once had a woodworker ask me to teach him to build curved stairs - he had an afternoon free and could pay me for two hours work. I spent two hours talking about the good ol' days and petting his dog, and invoiced him. I spent years learning it. I still take huge risks building them. I'll learn something new on the next one. While I do not mind sharing my knowledge when it is well received, it is not simple stuff. Curved muntins? I learn that every time I do it. And will again. Since we cannot do the door book here today, I can back out a bit and say the two most important things you need are a good mechanical mind, and aggressive, multi faceted problem solving. You may well have both since you have long experience. If you are nearby, come on by one Saturday, bring some good beer, and I'll tell you all about curved muntins and answer your questions. I'll also talk about them good ol' days a bit. Doug Fir has no rot resistance. The common African Mahogany other than Sapele is difficult to work. Very hard, squirrely grain that typically tears out. Spanish cedar or SA mahogany is a better choice. Door is made of plywood. Stop wasting everyone's time and build a new one properly. Door is delaminating. glue it back together with epoxy. No warranty. Door is delaminating. Glue it back together with epoxy. Modify it with complicated glass work. No warranty. You could spray some of the blue foam that we use around windows and door jambs. If you choose to go down that rabbit hole. Build a new door.There are plenty of cutters available for routers that will allow you to make such a door. In order to be accurate and safe we use shapers with power feeds. Making these type of doors is a risky proposition. They either work well for a decade or for 6 months. Then you start trying to fix them. We've all taken on projects that are sink or swim. Be prepared to lose a bit of time and money on this first door. Then decide whether its worth it to make another one. That's how we all learn. This is just my opinion but I think that any millworker that truely makes his money from this sort of custom woodworking and has been successful at it will tell you the same thing. 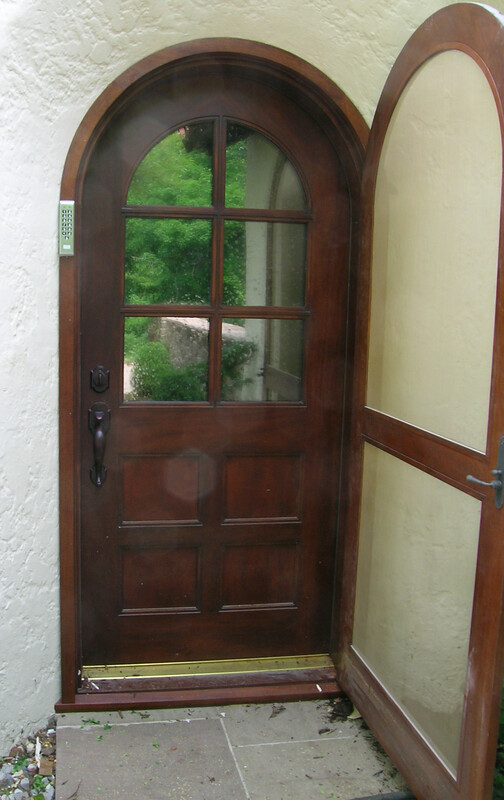 Making custom doors is an expensive time consuming practice and you need to have a customer that knows that and is willing to PAY for your services.